For an upcoming class on grains, I decided I wanted to teach a quinoa soup. 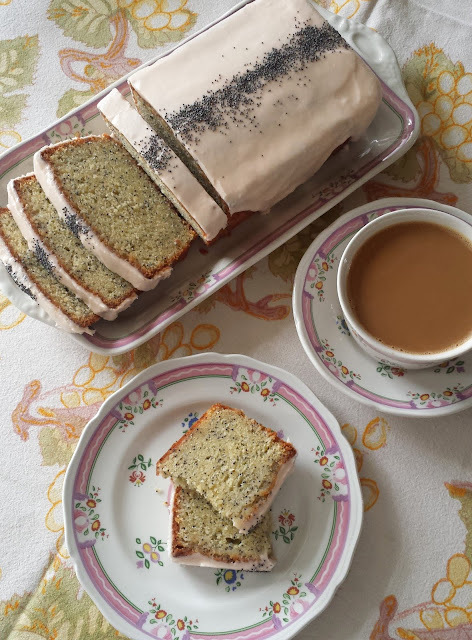 I tend to use quinoa only in salads and pilafs, but soup is a very traditional use of quinoa in its native Peru...and it is becoming more common here in the states if its presence in the blogosphere is any indication. I thought it was time that I expanded my quinoa horizons a bit. 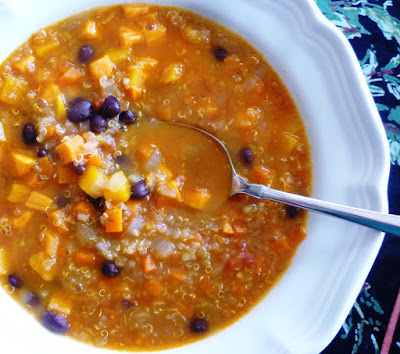 As I looked around at the kinds of soup people were making with quinoa, I found it varied from those that contained little more than quinoa (cooked in a simple broth) to soups with loads of vegetables, beans and greens in addition to the quinoa. 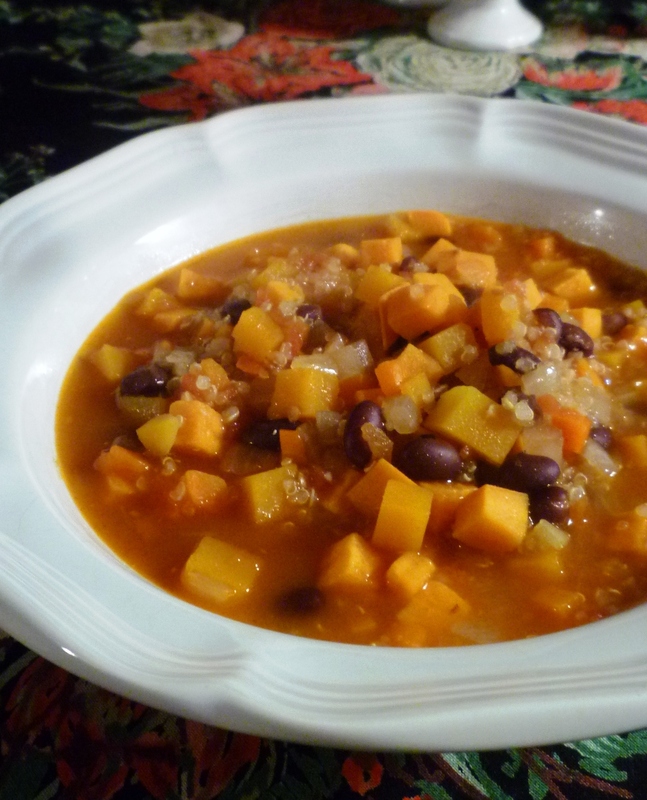 Inspired by one of these latter soups and a quinoa "chili" I found, I eventually decided to make a soup with a spiced tomato-y base, black beans and a short list of winter-y vegetables. The balance of flavors in this soup is remarkable. 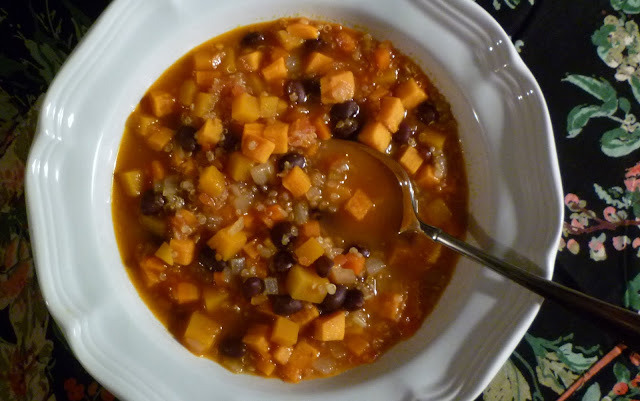 Tangy tomato, sweet spices (coriander and paprika) and vegetables (carrots, sweet potatoes and squash are all quite sweet), and slightly bitter and earthy cumin and quinoa all make for a soup of astonishing complexity and depth. I couldn't get over how much I liked it. I was also surprised by my reaction to the way the quinoa tends to swell even more as it continues to absorb broth during storage. Many grains and starches tend to do this as they sit in a liquid. Sometimes this results in unpleasantness (think about bloated pasta in minestrone)...and other times in an even better product (as in beans...which become plumper and creamier as they sit). When I looked at my leftovers the day after I first prepared the soup, I was dismayed to see how swollen the quinoa had become. I expected the soup to be gloppy and texture-less...and I anticipated that I would have to alter my recipe so that the quinoa was cooked separately and then added in fresh to each portion of reheated soup (which would have been a shame since cooking the quinoa in the soup adds wonderful flavor to the broth). But I was wrong. The soup was not at all gloppy. It still had a delightfully broth-y texture (after adding a bit of water upon reheat)...and of course, as with most soups, the flavor was even better after sitting over night. 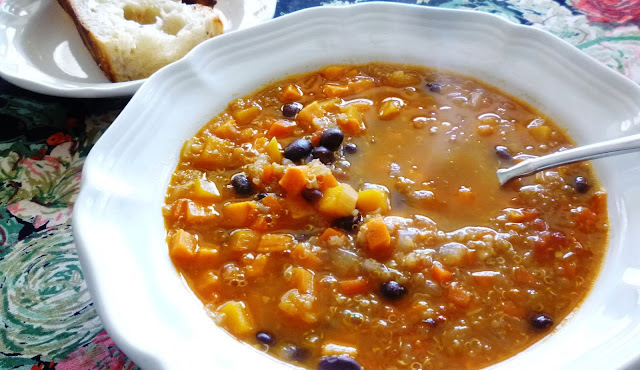 When I first made this soup, I don't think my plan was for a soup that was almost entirely a study in oranges and reds, but that's what I ended up with. And as I sat down to dinner on that first night...and then lunches over the next few days...I have to say that the colors made for meals that were a bright and happy spot in the midst of a spate of cold and gray winter days. Warm the olive oil in a soup pot set over moderate heat. 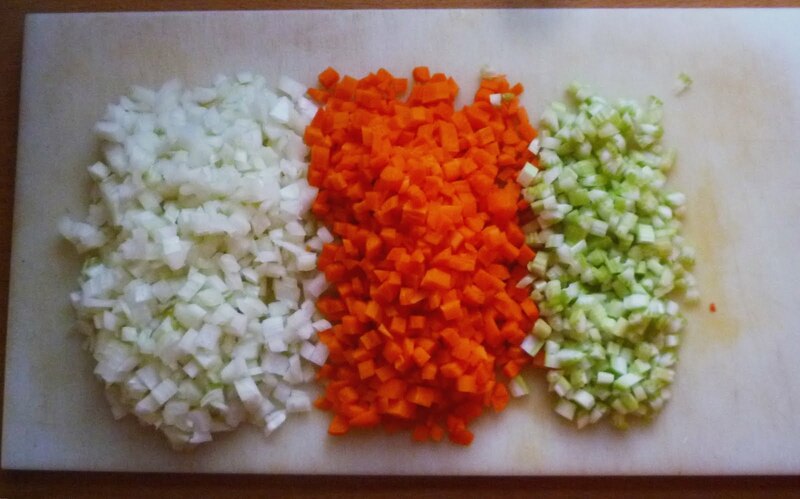 Add the onion, carrot and celery along with a good pinch of salt. Sweat until the onion is translucent and tender and the carrot and celery are just tender....about 15 minutes. Add the garlic and spices and continue to cook until fragrant and sizzling. 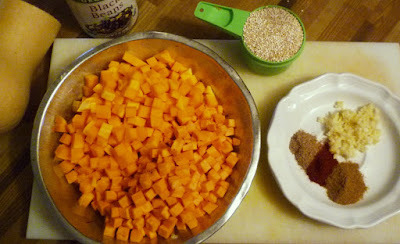 Add the squash and sweet potato, along with a good pinch of salt. Continue to cook for about five minutes, stirring regularly to make sure the vegetables are well coated with the seasonings and are not sticking to the bottom of the pan. Add the tomatoes, stock, beans and quinoa. Stir well and bring to a boil. Check the seasoning again (adding salt as necessary). Cover the pot with a lid that is slightly ajar and reduce the heat to a simmer. Cook until the vegetables are tender and the quinoa has unfurled its germ...about 15 to 20 minutes. Correct the consistency with boiling water...or more hot stock...if the soup is too thick. Let the soup stand for 5 minutes off the heat. Check the consistency and seasoning again and serve. The goal with the sweet potatoes and squash is to obtain 3 to 3 1/2 cups diced vegetables...if your sweet potato is small, use more squash...if it is large, use less squash. You could use all one or the other too...I just like the idea of the slight variation in color, texture and flavor. If you prefer, you may use chickpeas instead of black beans. The spices were measured with a slightly rounded spoon, rather than a level spoon. The soup is delicious after the first day...but the quinoa will have absorbed more liquid. Be prepared to add a bit more water to the soup as it is reheating in order to obtain the consistency you prefer. Delicious! I added 3-4 slices of bacon. I cooked the bacon, took it out to soak on paper towels, then added the veggies to cook in the 1 Tbsp of the bacon oil. When the soup was done, I added back in the crumbled bacon. The bacon taste complimented the sweetness of the winter vegetables beautifully.